Grocery Rebate, or Tax Free? I was asked by Senator Cliff Bayer to co-sponsor a bill to repeal the grocery tax in Idaho. This is the one where you pay on food, then get a tax credit when you file your income tax. It seems a little crazy to me for the government to charge you to buy food then credit back the money to you at some later date. I believe the original intent was to try to capture tourists and the like who buy groceries and use our services, then don’t file income taxes in Idaho. My thought is, that could be a valid point, but they still buy fuel, beer, and eat in restaurants, all of which are taxed. There is a little loss to the state, and a little gain to you, and one less silly-looking government transaction. 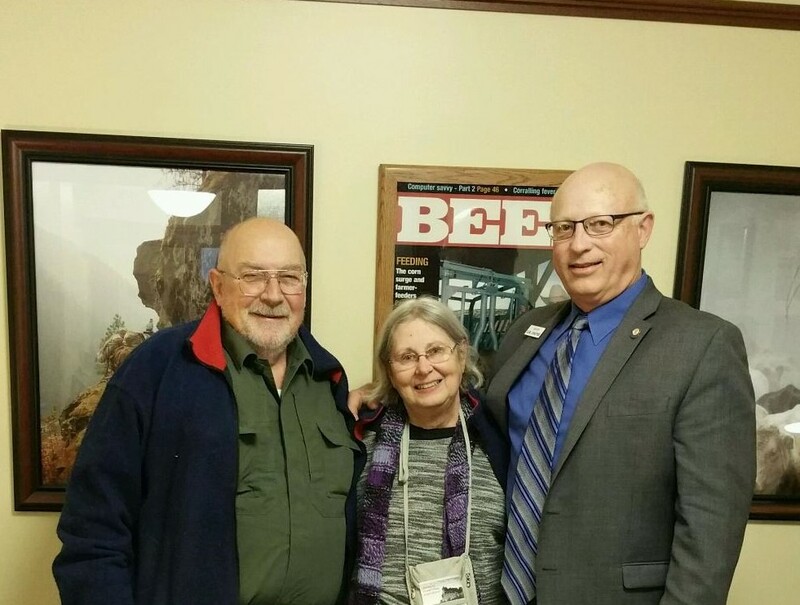 Jon and Patricia Menough, Elk City constituents, were in town visiting legislators. They stopped by my office. It was so good to see, “real people”, from home! Jon is the president of the Idaho County Republican Central Committee, and Patricia is the Secretary. One of the presenters to the Joint Finance Appropriations Committee (JFAC) this week was Henry Atencio, the new director of State Prisons in Idaho. I will say I was very impressed with this young man. I understand he is a home-grown Caldwell boy, who has worked his way from the bottom of the ladder to the top. He started out as a probation officer and now heads an organization managing in excess of $225,000,000. Idaho has some talented people working in government…not all, but this one looks the part. We have 8,000 people in prison in Idaho and 16,000 under supervision, at a cost of over $14,000 per person, per year. I met with another impressive state employee this week. (I am trying to redeem myself from the constituent criticism I received about my caustic agency comments in previous newsletters!) She is Angela Hemmingway, the director of the Idaho Science, Technology, Engineering, and Math (STEM) Action Center. According to a report by the Idaho Department of Labor, by 2025 Idaho will be lacking approximately 63,000 individuals needed to fill projected positions ranging from construction and service jobs to medical and technology positions, many of which involve STEM-related skills and knowledge. Angela’s charge is to increase statewide efforts in computer science awareness and access, kindergarten through career. This is a business/ government partnership to fill the needs of the state. They couldn’t have picked a better person to lead this effort. Angela is a multiple winner of Idaho Teacher of the Year when at Kuna. She is a bright, dynamic young Idahoan who demonstrates the best of Idaho’s future. Learn more about the Idaho STEM Action Center by clicking here.